More exciting news to share with those of you who live in Los Angeles, specifically in the San Fernando Valley. 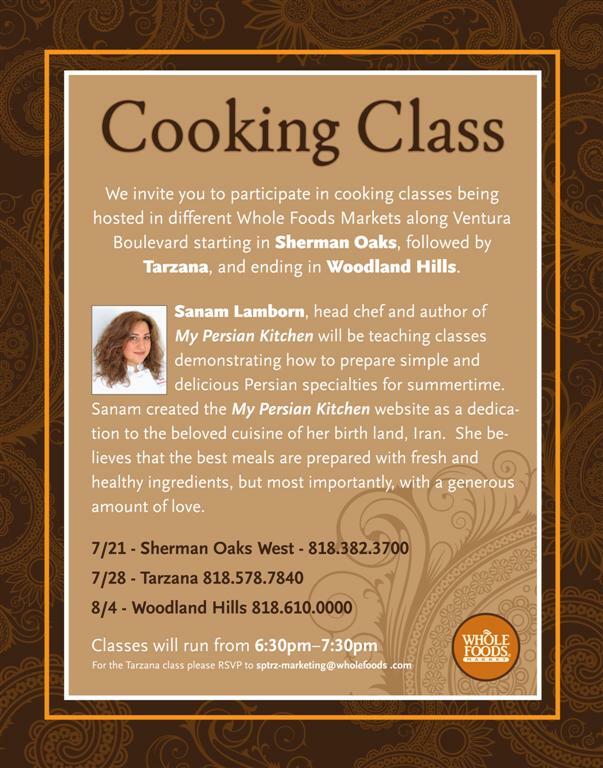 Guess who is doing cooking demos at your local Whole Foods Market??!! So cool Sam! I live a 5 min walk away from the Sherman Oaks “east” store…do you ever have plans to do a class there? Joy Joy, it depends on Whole Foods and where they want to hold the classes. Hopefully, someday I might make it there! So you do have a name! Sanam, I wanted to thank you for your Aash-e-mast recipe.I too had found everyone’s recipes to be quite varied. When these were invented they were handed down by word of mouth, sort of like the daastaan stories, and even if you wanted to make your Aash the same way each time, you couldn’t. Then I realized why we use the same word for the parts of the year as we do for the decision of which various sabzi we put in the soup! Mahmud, the owner of the two Shiraz restaurants, had told me what greens he uses and it was almost the same as yours with the addition of the mint. Mahmud had told me though, that the most important thing to duplicate his dish was to use only calrose rice instead of legumes. It still took two tries with your recipe, the second time I made half the amount and left out the meatballs so I didn’t have to give up at eleven PM exausted. When my friend Pam tasted it she said to me ‘You’ve done it!’. I started to try to make this soup two and a half years ago! I have rsvped for the Sherman Oaks Demo, will the other two be different? Oh and Mahmud, If your reading this, Thank You too! Hello El Gazador! Yes, I do have name!! Thank you for your comment. Indeed, all the recipes were passed down by word of mouth and each person added their own twist to it. I had never heard about adding calrose rice but thanks for the new found info!!! Congrats on mastering Aash-e-mast! Each location of the demo will feature different dishes! You might want to follow me around the valley!!! I look forward to meeting you at the cooking demo! Kathy, thank you for your comment. I am going to put your recipe on my requests list. I am planning on having cooking classes in early 2011 so stay tuned!